In the Spring of 2017 I started experimenting with transforming my narrative illustrations and prints into ceramic designs. I wanted to see what my work would look like in 3-dimensional form. I was limited by my kiln size and not sure if it would even work. But I knew I wouldn't know if I didn't try. I transferred "Lady Wisdom" onto clay slabs, allowed her to dry to leather hard (she survived cracking - Whew! ), then carved out the details. 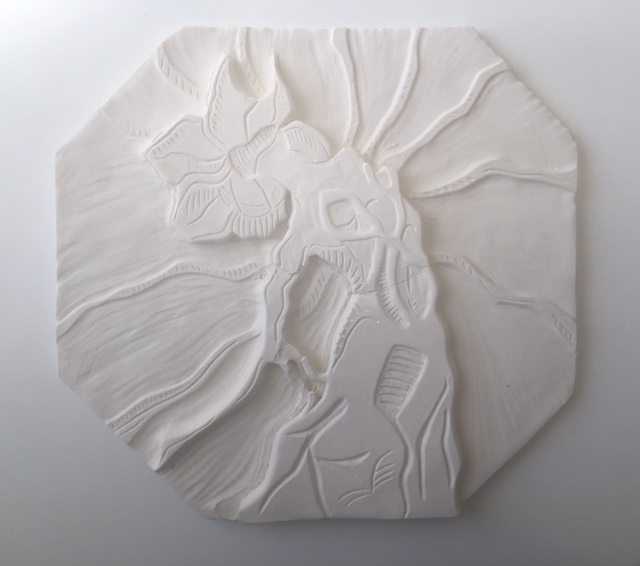 Total it took about two weeks to complete the design, carve, and allow her to fully dry before firing in the kiln. When she came out what I saw was heartbreaking... she had lifted from the base and a large crack split right through her waist. I had planned on entering her in the Erie Art Museum Annual Spring Show... but now? Now she was ruined. During a recent meeting with some other local artists we discussed the Lady's broken state. I had saved her, stubbornness, and the lingering "what if's" refusing to let me throw her out. My colleagues reminded me that perhaps she didn't need to be perfect to be meaningful, that maybe her brokenness could have a message in itself. I remembered the Japanese philosophy Wabi-Sabi. It means to find beauty in the imperfections, the flaws, the passage of time. A college professor once told me "never get too attached to a piece of work", I took this to mean don't get so attached that I'm unwilling to make changes or experiment out of fear. He was right. And so were my colleagues. Yesterday I dusted the Lady off and brought her to my workspace while I contemplate what to do next. Here in the light she IS beautiful, with all her flaws. Check back to see her transformation.